To help build a more harmonious society, The Hong Kong Jockey Club Charities Trust has invited the School of Public Health of The University of Hong Kong to collaboratively launch a project entitled FAMILY: A Jockey Club Initiative for a Harmonious Society (“FAMILY Project”) with a HK$250 million funding. The project aims to identify the sources of family problems, to devise, implement and evaluate preventive measures, and to promote FAMILY Health, Happiness and Harmony (3Hs) through a territory-wide household survey, intervention projects and public education. 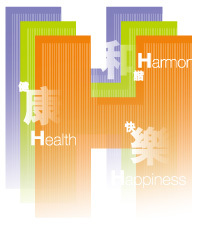 The project is based on the premise that traditional Chinese values of cherishing family relationships can still be adapted to modern-day life, and can help promote the 3Hs – Health, Happiness and Harmony- across generations. The project focuses on the family as a unit. It is preventive in nature, rather than trying to rectify what has occurred. The project uses a public health approach that brings together various scientific disciplines such as medical, behavioural, environmental and social sciences. It also links with social customs, education, journalism and the media so as to identify the sources of domestic problems and derive a preventive response that is complementary, wide-reaching, pervasive, and cost-effective. The Government and other related organizations will be able to use the evidence and information to formulate long-term public policies and services. To promote FAMILY 3Hs and FAMILY Holistic Health, the project advocates the Triangle of Health – a healthy lifestyle with 3‐E (Enjoyable, Easy and Effective) 0‐1 Exercises (Zero‐, Negative‐ and Minimal‐time [1 minute]); 3‐M and 3‐L healthy diet (More vegetables, More fruits and More fibre; Less sugar, Less salt and Less fat), and 3‐P living attitude (Positive Psychology) (Positive emotion, Positive family communication and Positive family relationship), so as to change usual mind‐behaviour‐set and achieve sustained behavioural changes and FAMILY Holistic Health (an integration of physical and psychosocial health).